Families that Play, Together Stay Together! #gbnf Families that Play, Together Stay Together! Here is a little video clip from the holidays in my home town. Neighbor gifts are important and Mrs. Clauses and her elves worked hard this year. We went to The Bean Museum at BYU to look at the animals. Have you ever ran into an emergency situation and not even known it was an emergency situation? I have a story to share today. It was one of the most alarming situations ever but came off really confusing. I went on mission for my religion for a year and a half. Upon returning from being away for so long I wanted to see people that I had not seen during that time. One of the most important people, was my great grandpa. He had a bad accendent right before I had left and broke his jaw. Our goodbye was really heart breaking. I couldn’t wait to see him. My family told me how good he had been doing, how he had held in the time I was gone. They also told me that my English was just fine. Those are two important statements because when we went to visit him he seemed normal yet I could not understand anything he said. I was confused beyond belief. We stood in his kitchen and I looked back and for to my family that seem as calm as can be and my Great grandpa who was speaking what I could only guess to be German mixed with Mandarin. My dad said, “Why don’t we go into the living room?” and I thought “Well, I understood that.” My dad lead my grandpa to his recliner and then sat us down. He grabbed the phone in his hand and told us to keep talking to Grandpa as he called his dad and the hospital. 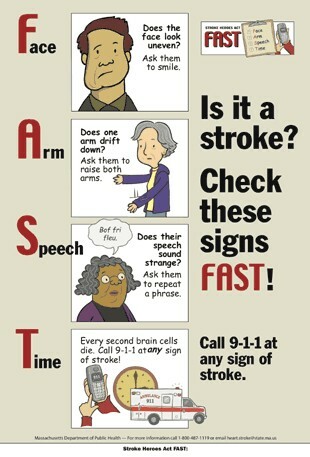 My great grandpa had a stroke. We were lucky enough to visit him in time to catch it. It was terrifyingly confusing. So, with that and this post always remember F.A.S.T! And here is a fascinating clip from T.E.D about a scientist who studied strokes and then had one herself. Educate yourself. My great grandpa is alive today because my dad was F.A.S.T.